On a Sunday afternoon, a group of children, whose ages ranged from 6 to 15, joined a workshop in a room at the National Library of Indonesia on Jl. Medan Merdeka Selatan in Central Jakarta. They concentrated on drawing their fantasies on top of a pillow, as adult facilitators and parents looked on. 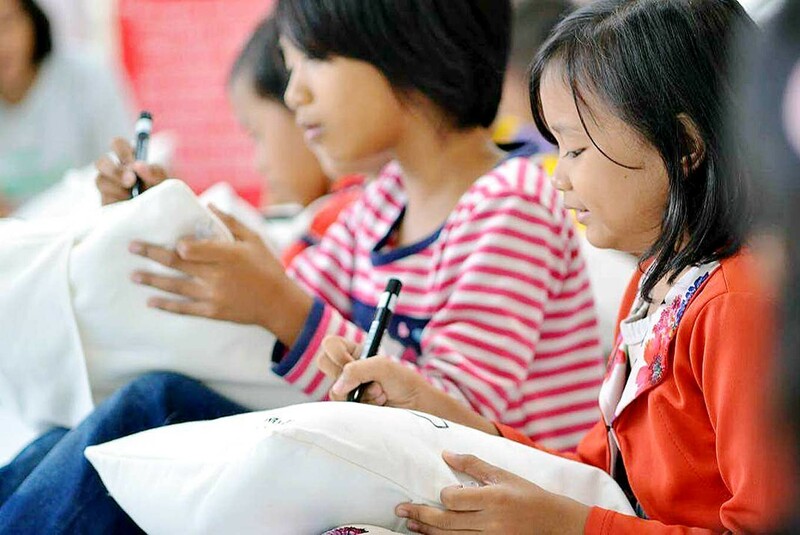 One participant named Fika, 10, who lives in East Jakarta, was drawing a female figure on top of her pillow. “I draw who I want to be when I grow up; I dream of becoming a [medical] doctor,” Fika told The Jakarta Post. She was one of the participants of the newly launched Festival Cerita Jakarta (Jakarta Storytelling Festival), held on Dec. 16 and 17 inside the library. The festival was organized by a community that focuses on literacy promotion among children aged 6 to 18 called Rumah Cerita (House of Stories), sponsored by the Australia Global Alumni and supported by the National Library. Over two days, the festival presented various workshops and sharing sessions focusing on bolstering creative thinking among participants, encouraging them to not only articulate their ideas clearly, but also transform them into concrete output. Another pillow drawing workshop participant, 15-year-old Ramadan who also lives in East Jakarta, was way too shy to show his artwork to the Post. Nevertheless, he said he found the activity to be really fun and helped him to find new friends. Other mind stimulating workshops at the festival included drawing visual interpretations of song lyrics, coming up with a concept of an ideal library, creating imaginary friends, experiencing what it feels like to be a journalist on assignment, and many more. A sharing session involving activists of the RANGKUL Project, promoting tolerance and friendship in the melting pot of Jakarta through conversations with strangers that are broadcast through digital platform, introduced pluralism to participants. A recycling workshop promoted environmental conservation. A 10-year-old boy named Umar came onstage at the festival’s closing to read out his idea of an ideal library. It included an outdoor playground that he and his peers could play on when they got bored of being confined to a room. The children’s enthusiasm shows that they are inherently imaginative and curious; it is often us adults who lack the imagination to nurture and stimulate their minds properly. The regular Indonesian school curriculum, meanwhile, focuses more on memorizing facts and not on inquisitive learning. The newly launched festival seeks to fill this void by encouraging participants to be more imaginative and think outside the box. 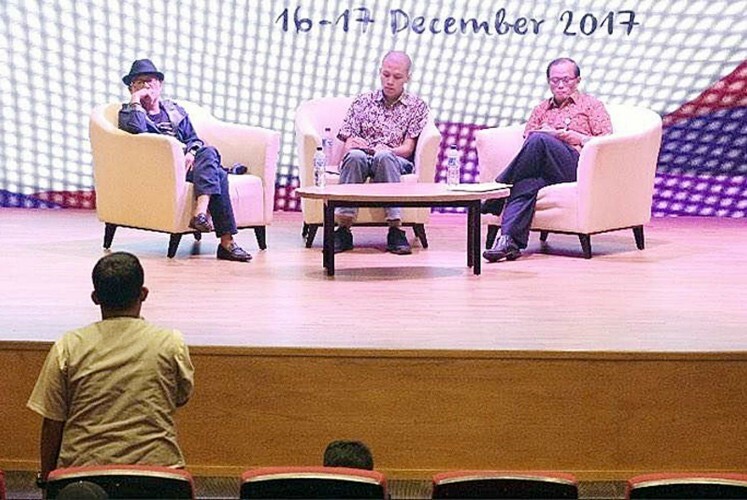 The festival featured a keynote speech from intellectual Nirwan Ahmad Arsuka who initiated the Pustaka Bergerak (Mobile Books) program, distributing books to children throughout Indonesia. The festival also invited a young Pustaka Bergerak volunteer, a second grade Elementary School student from Lampung named Khoirul Alvin Romadoni. The festival also included a session on the social purpose of libraries facilitated by National Library chief librarian Supriyanto as well as film director, writer and café owner Richard Oh. “This festival responds to flourishing literacy promotion programs across Indonesia, which involves mobile library establishment and book distribution. 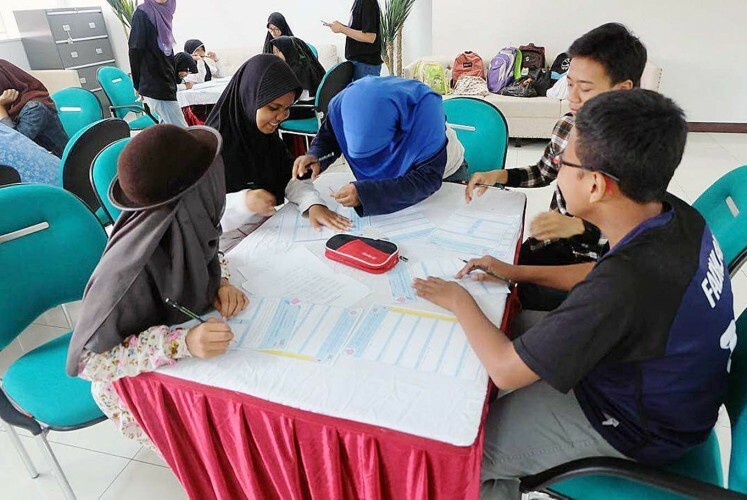 We want to take it further by promoting self-confidence in coming up with original ideas among children as well as the skill to articulate it,” festival director Aqmarina Andira told the Post recently. According to Aqmarina, the festival also seeks to boost children’s self-confidence in presenting their ideas and works. The two-day festival was run entirely by volunteers, some of whom came from outside Jakarta: Surabaya in East Java; Semarang in Central Java as well as Pandeglang in Banten. One of them was Rizka Ramadhani who spent around four hours on a plane from Surabaya to volunteer at the festival. “I have chosen to join the festival because I believe in the mission of literacy promotion,” Rizka said, adding that she also enjoyed the camaraderie of fellow volunteers who were also passionate about education. According to Rizka, the most memorable experience was on the Sunday, Dec. 17 when the festival committee was doubtful whether they would attract any participants to the festival due to a peaceful rally on the Palestine issue organized that day. “After seeing some protesters join the festival as a family, we were encouraged and actually promoted the event to protesters who brought their children along. They turned out to be very interested in the event and joined the festival enthusiastically,” she said. That day, the potential crisis was averted thanks to the dedicated volunteers, whose enthusiasm also made the participants’ eyes light up with joy through the workshops and sharing sessions. “If [the committee] conducts this event again next year, I would tell my friends to come to the National Library and have fun together,” Ramadan said.